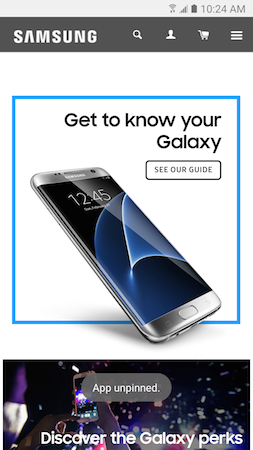 Galaxy S7: How do I pin applications to the Home screen on my Samsung Galaxy S7? 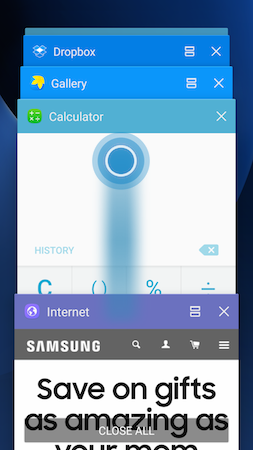 You can pin an application to the screen of your device. 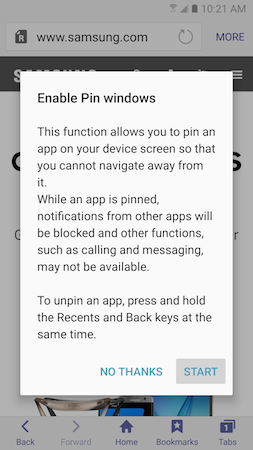 This feature locks your device so the person using it has access to only the pinned application. Pinning an application also prevents other applications and features from causing interruptions, and it keeps you from accidentally exiting the application. 3. 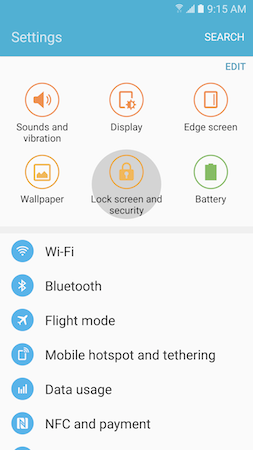 Touch Lock screen and security . 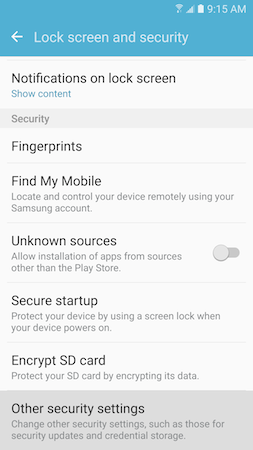 Note: It might be necessary to scroll to and touch Lock screen and security . 4. 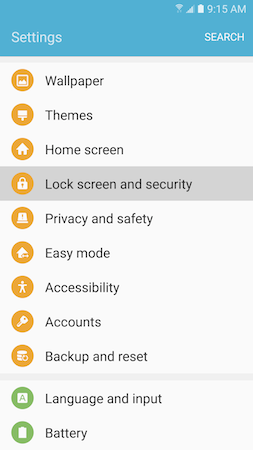 Scroll to and touch Other security settings. 5. Scroll to and touch PIN windows. 6. Touch the slider next to Pin Windows to turn it on . Note: Calling, messaging, and other functions may not be available while an application is pinned to the screen. 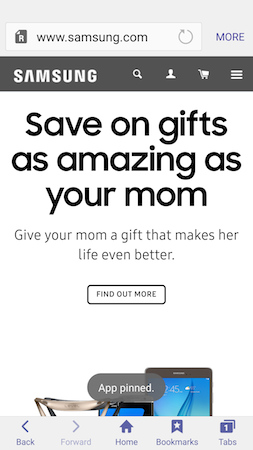 Also, access to other applications will be prevented. 1. Open the application you want to pin and touch Recent . 2. 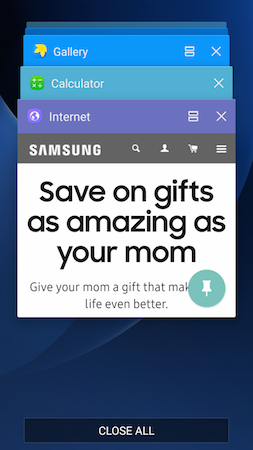 Touch the Pin icon in the bottom-right corner of the application window. Note: It might be necessary to swipe your finger from bottom to top to access the icon. 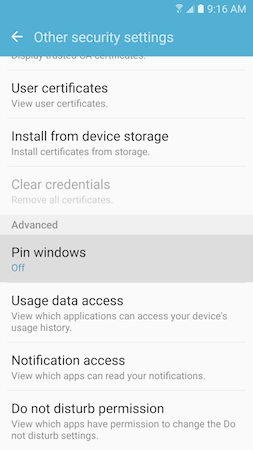 3. Review the information about pinning applications and touch START. 4. 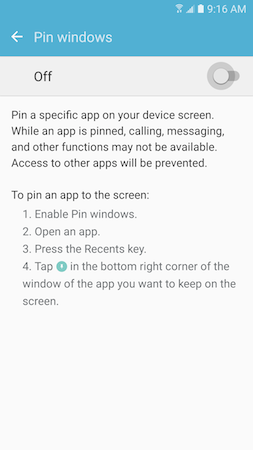 The application will pin to the screen, and your device will display the App pinned. 1. Touch and hold Recent and Back on your device simultaneously. 2. 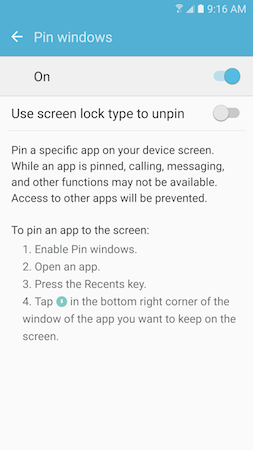 The application will unpin from the screen, and your device will display the App unpinned message. 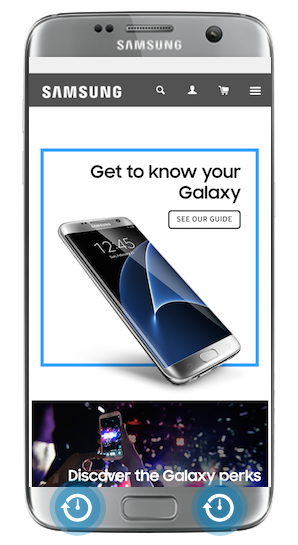 Galaxy S7: How do I open applications in Split screen view on my Samsung Galaxy S7?